Lois Gladstone is the newly appointed CFO at Gliebers Dresses. Her job is a simple one ... "Clean Up The Mess!" In other words, it is her job to find a path to profitability, the kind of profitability that Gliebers Dresses enjoyed earlier in the decade. Ms. Gladstone operates like any good CFO. She thoroughly reviews the profit and loss statement, looking for areas where expenses can be reduced. 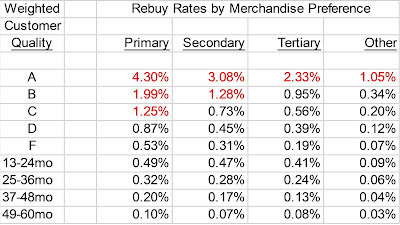 The Gliebers Dresses profit and loss statement indicates that the biggest line-item expense is marketing. And within marketing, the biggest line-item expense is customer acquisition. Gliebers Dresses loses money acquiring new customers. Ms. Gladstone thinks she found her area of focus ... if she can reduce unprofitable customer acquisition activities, she can fix the profit and loss statement. Ms. Gladstone shared her opinions with me. "As best I can tell, we're losing a ton of money acquiring customers, Kevin. This has to stop." I pulled out a slide that I share with a lot of Executives (the image above, click to enlarge it). The top portion of the slide shows what happens when you profitably acquire 175 customers per year for ten years. 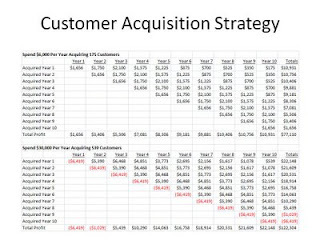 The bottom portion of the slide shows what happens when you lose money acquiring 539 customers per year for ten years. The secret, of course, is to find the optimal payback period. In this example, a two-year payback period is sufficient to justify losing money on customer acquisition. "This isn't Gliebers Dresses data Kevin, so this doesn't apply to our business. After all, isn't it always cheaper to retain a customer than to acquire a new customer?" I explain that in theory, the statement is true, but the practice you won't have any customers to retain if you stop acquiring new customers. "Then why do so many companies have loyalty programs, Kevin? People wouldn't have loyalty programs unless they worked, right? Why don't we simply shift our unprofitable customer acquisition budget to customer retention activities? Wouldn't you rather give best customers promotions and discounts than waste that money on new customers that may never buy again? Or wouldn't it be smarter for us to invest money in improving the website buying experience? Why spend all this money acquiring customers if we don't provide them with a great online experience? I really don't want to chase bad money with bad money." It becomes clear that my simple slide isn't sufficient to explain the concept of customer acquisition and customer retention dynamics. I'm going to need to build a simulation tool that lets Ms. Gladstone play with the evolution of her business on her own terms. And I'm going to have to get the facts. Ms. Gladstone may be right, or she may be 100% wrong. The data will point us in the right direction. "You know, Mr. Glieber told me that I have one year to fix this business, so I don't have time to waste, Kevin. I'm going to have to make changes to the way that we invest scarce resources. Historically, our online division has posted solid gains, just go look at the data over the last ten years. Even now, in the midst of this mind-numbing recession, the online division is hanging in there. Maybe it is time to shift our marketing activities online, where all of the profit is." I asked Ms. Gladstone how her thoughts compared with the intense catalog legacy that permeated the building. "I think you have to follow the dollars, Kevin. Profit seems to have migrated online. The profit and loss statement quickly leads you to a strategy where you are retaining customers online as a business model. Our business model seems skewed toward acquiring customers using traditional media. I don't think you need to be a futurist to understand that there is a disconnect. But this will probably be a tough sell, Kevin. We will have to figure out a game plan for teaching the company that online strategies need to replace traditional marketing strategies. And then there's the whole legacy skill-set issue --- how do you teach a merchant used to optimizing selling square inches to now optimize landing pages? It will be a lot to achieve in the course of just one year." I face challenges like this in the majority of my projects. The key is to let the customer data speak for itself, to not pre-judge any strategy until we have the facts. In this case, it is time to start acquiring appropriate metrics to either prove or disprove Ms. Gladstone's hypotheses. Really enjoying this so far, Kevin. I'm increasingly thinking that there's a lot of content that can be written about this fictional company. This is really great, Kevin. Can't wait to find out what their retention rates are. I sort of wish this were like one of those old "choose your own adventures" books that my second grader now reads. 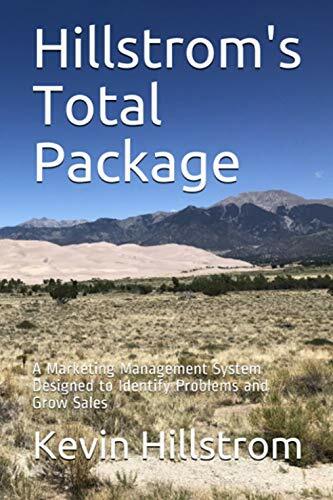 Then you could choose something like, "if the business is a pureplay with a 20% retention rate and is in acquisition mode, go to page 35 - if the business is in hybrid mode with a 48% rate, go to page 93 - etc." Then we could play the story you're creating out more than once with different endings. (Oops, I think I've just revealed myself as a data geek). All I need now is time and funding! !